I was invited to review Mamounia Lounge in Knightsbridge a few weeks ago, I jumped at the chance of sampling some delicious Middle Eastern food. Plus it had been a long time since I ate in Knightsbridge and I felt like I needed to return there. 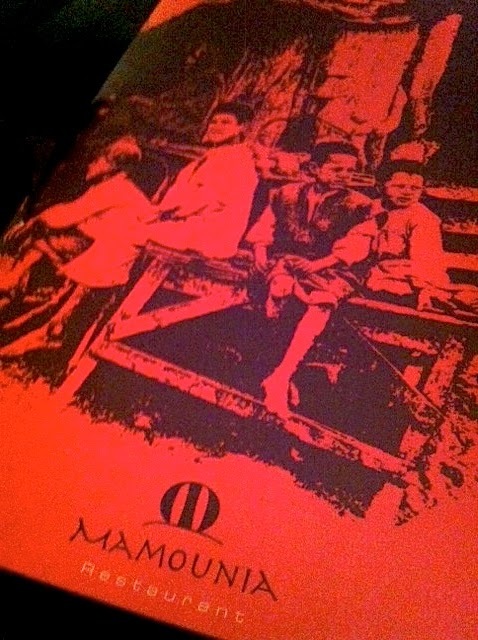 Mamounia is a cross between a restaurant serving very good Middle Eastern food and a funky little lounge playing some pretty good vibes. You know this part by the bouncers on the door as you enter. The interior is slick, modern, clubby and romantically dark with as I said some good vibes. Romantically lit restaurants set the scene for a quiet, cosy night full of small talk, but are bad for taking photos as you can see. So I apologise for them. But the taste of the food is really what matters. One hot meze of Chicken Pastilla and the Lebanese Meze Platter were ordered to begin our feast for the night. 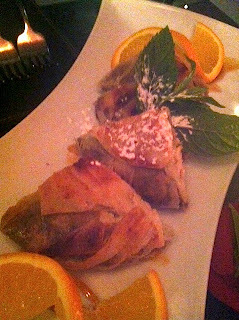 The Pastilla of Chicken baked in filo pastry with almonds and cinnamon. 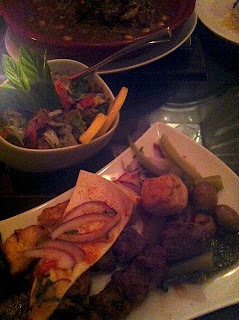 The light parcels were as good as we had in a small restaurant in Marrakech a few years ago. Well seasoned chicken and delicate filo pastry made for a lovely starter. 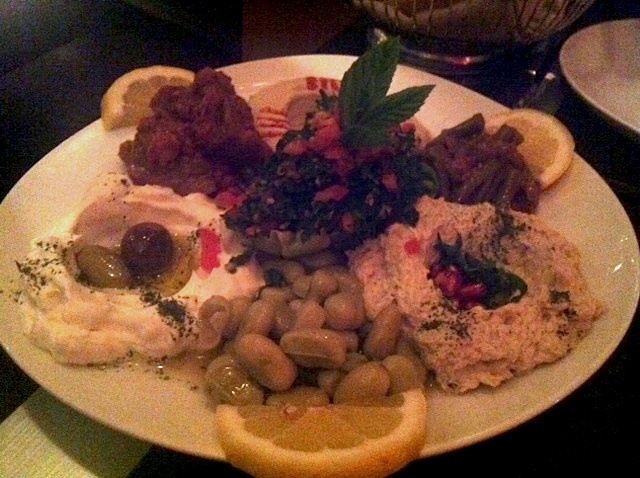 The Lebanese Meze Platter, which consisted of Baba Ghanoush, hummus with tahini, a yoghurt and cucumber dip and Tzatziki. Oh and of course freshly basked warm bread. This was a really good selection, I’m not normally a fan of hummus with tahini, as I prefer a natural hummus only flavoured with lemon and cumin, but this was a very good one. The Baba Ghanoush was as good as it gets with its smoky undertones and rich creamy texture took me back to my favourite little joint in Talat Harb in downtown Cairo. Ahh how I miss that place. 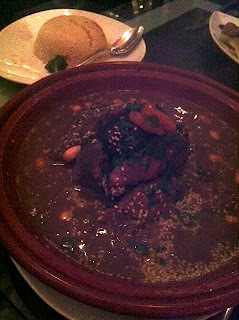 Of the two mains we had the Tagine of slow braised lamb shank in a tomato sauce was the highlight of the evening. This rich dish could have actually fed the both of us quite easily. The lamb was falling of the bone and melted in our mouths, the sauce although it was supposed to be a little spicy I never really got that and to be honest it didn’t need to be. My mixed grill was ok but nothing really to wow or amaze. The meats were grilled to perfection, all still juicy and not overcooked, they just did nothing for me that’s all. I’m not sure they were cooked over charcoal as it lacked that smoky taste that I love with grilled meats. But if you do go, you have to go on a Saturday night, as there is a rather voluptuous belly dancer that had everyone’s attention when she began to shake those hips. Pretty outstanding by the looks of our fellow diners. I have to say the staff were fantastic, the girls really kept that place going even though it was really beginning to more and come alive towards the end of our meal, it seems this place is certainly on the map with the movers and shakers of Knightsbridge. 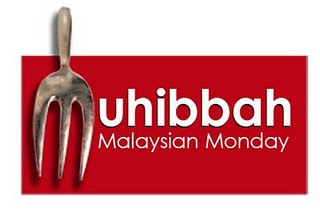 So if you are ever in or around the Knightsbridge area, especially at night, I’d recommend popping into for some luxurious and excellent Middle East Fusion food.